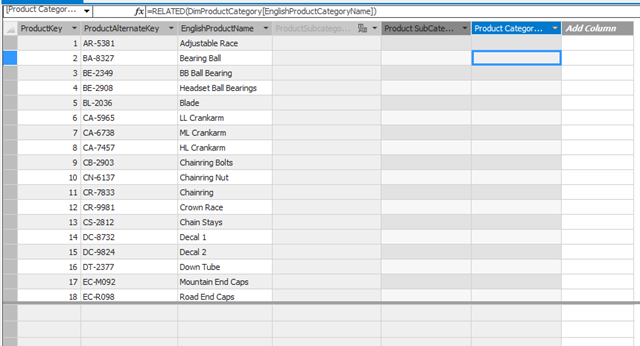 Recently I was looking at the Adventure Works database and I noticed how Product, ProductCategory, and ProductSubCategory are their own separate tables. It got me to thinking about how someone might want to take attributes from each of those tables and create one hierarchy for reporting when you are looking at it. 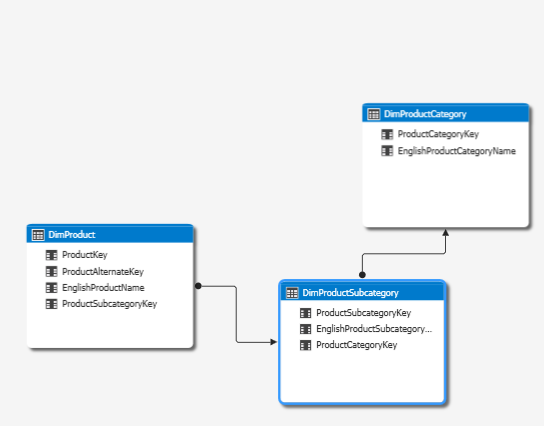 In DAX, this can be accomplished by using the RELATED() function. By using the related function in our table with our lowest level attributes, we can bring in the higher levels and create our hierarchy. This is really useful, especially if our data source isn’t necessarily a data warehouse and may be something more transactional with many tables split all over the place. And that’s it! Now we have all of our related attributes in one table that we can create hierarchies off of. This is very useful for multiple snowflakes in a warehouse or transactional databases. Once it runs and extracts (this could take a few minutes depending on your updates), Once it finishes it will proceed to the Setup Support Rules wizard, where they will run and inform you of any issues. Assuming everything passes fine, Click Next. Once you click Next, you’ll be on the Setup Role screen. Select the feature you want. 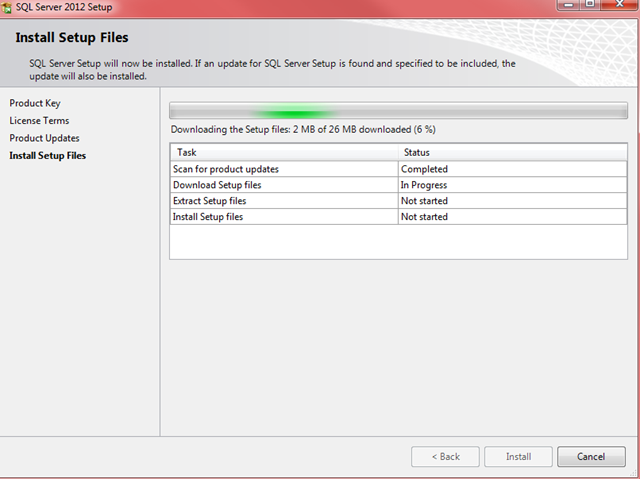 In this instance, we want the SQL Server Feature Installation. The next screen is the fun one. Select the features you want to install. In my case, this is for my regular development I do from my laptop and for quick demos when I need them. I’ve selected the features I want, and I’m ready to click next. One really nice feature in 2012 is that Master Data Services can now be included with the regular install, in 2008 R2 it was it’s own install file that you had to find in the setup files. 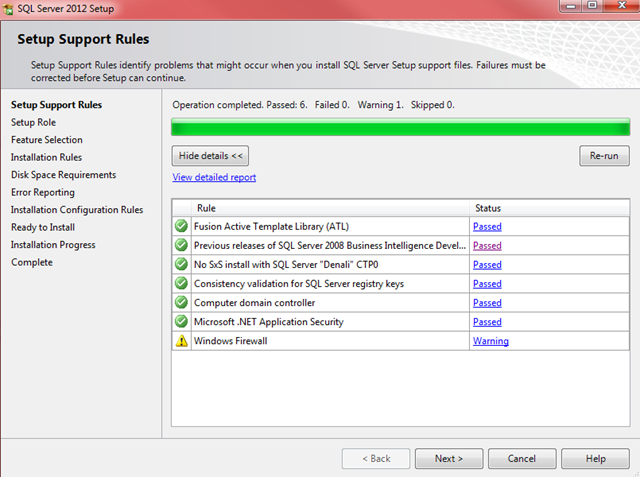 Once you click next, the Installation Rules wizard will run. Let it run and then click Next. 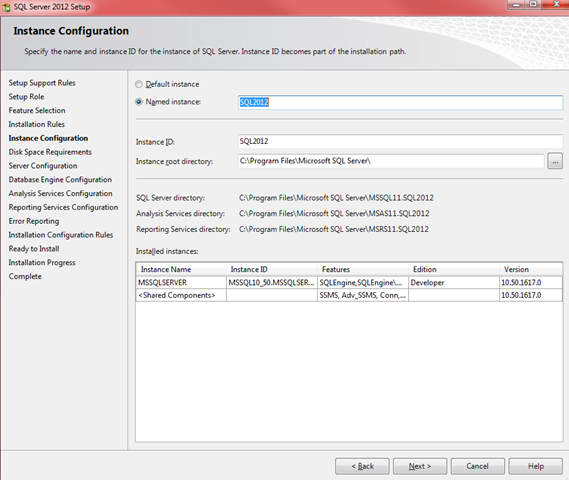 The next page is the Instance Configuration page. Select if you want the default instance or if you want a named instance running on your machine. 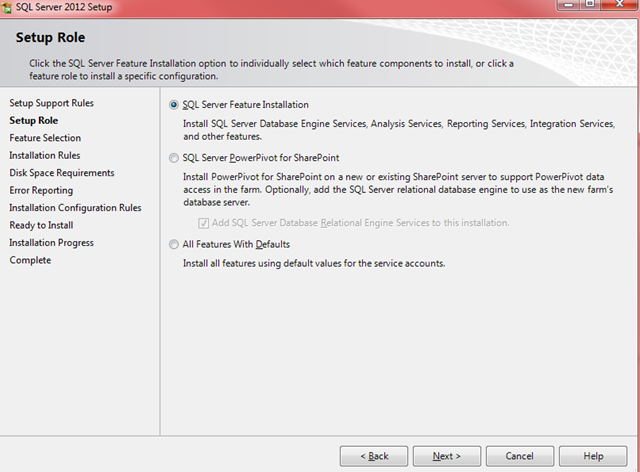 On my machine the default instance is already being used by 2008 R2, so I’m installing a named instance. Also please note the Instance Root Directory. 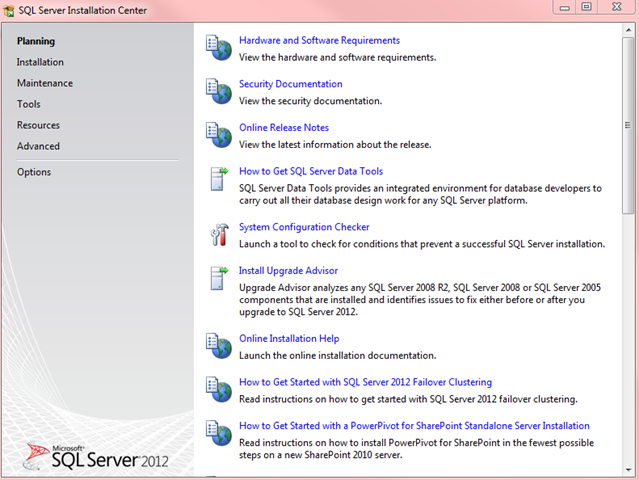 This is the default installation path for SQL Server. It is a Microsoft best practice to install it on a volume OTHER than your C: drive. And yes, I know I’m breaking that very rule here due to the options on my machine. Click Next, and the Disk Space Requirements wizard will run. Click Next. Configure your service accounts and click Next. It is considered a Microsoft best practice to use separate, least-privileged domain accounts to run each of the services needed. This prevents having one “super-account” that has permissions to do everything on your server. 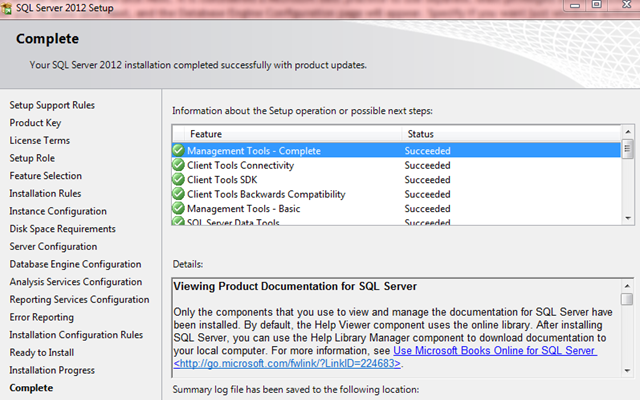 After you’re done click Next, and the Database Engine Configuration page will appear. Specify if you want just windows authentication or mixed mode, and then add a user to the administrator section. If you select mixed mode you’ll need to specify a password for the SA account. 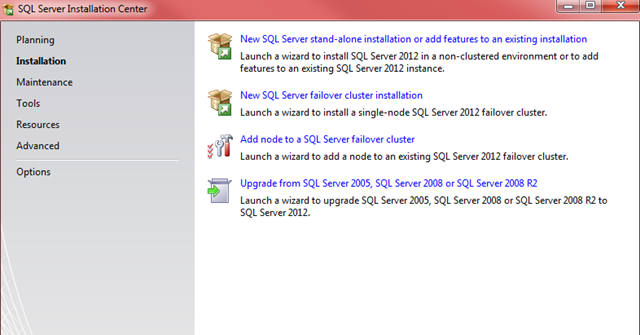 On the data directories tab create your installation paths (keeping in mind they should NOT be on the C drive). 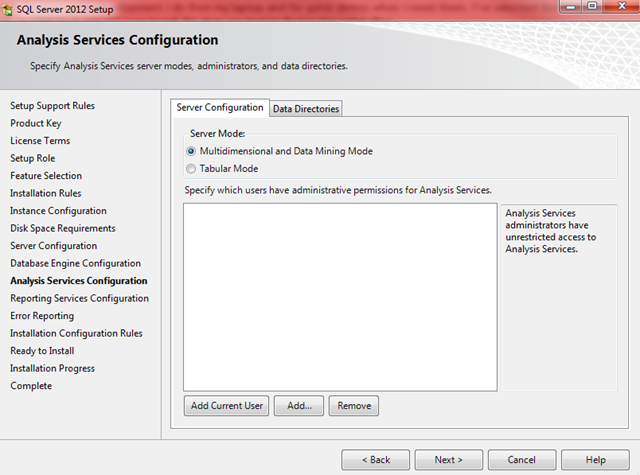 Once you click Next the Analysis Services configuration screen will appear. 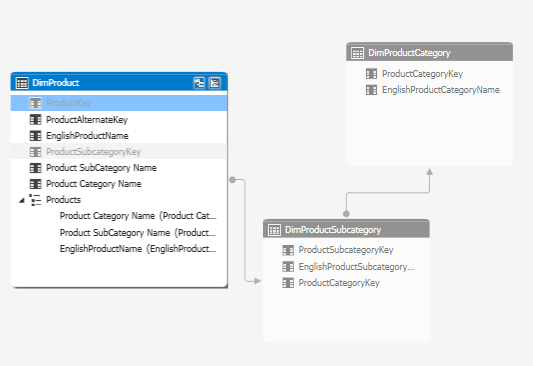 Select if you want to install Multidimensional or Tabular mode, and the admin for the instance. On the data directories tab, change the path to something other than the C drive. If possible, this should be on a drive separate from your database engine and tempDB as well. Analysis Services works best on its own drive. Click Next. 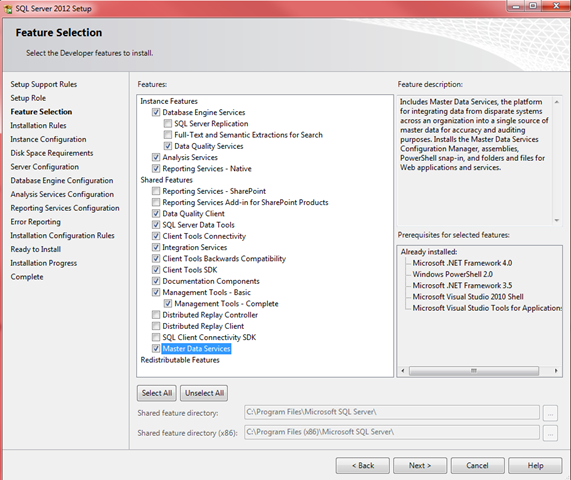 On the Reporting Services Configuration page, select Install and Configure if you want it to be configured for you while its installing or if you just want to do the install and configure it yourself later via the Reporting Services Configuration tool. Click Next, and check if you’d like to send Error Reporting to Microsoft. 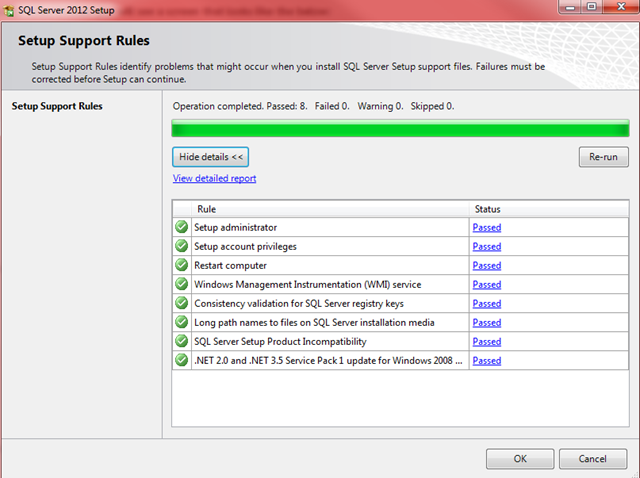 Click Next again and allow the Installation Configuration Rules to run.